Kevin Newman has announced that, come this August, he is leaving the anchor position on Global TV's nightly newscast. 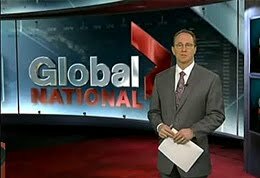 Global is the Avis Rent-a-Car ("We Try Harder") of Canadian TV News...in surprising second place behind CTV but ahead of CBC's The National, that venerable institution which has undergone more face lifts than Joan Rivers. Why CBC with its powerful editorial bench strength remains in third place is the subject of much internal rancor and heated discussion at the CBC. As for Global, the fifty year old Newman is a former CBC-er who cut his journalistic reputation in the US with ABC. He has (only) been anchoring Global for nine years which makes him a TV tyro compared to CTV's Lloyd Robertson (age 76, 34 years as anchor) and Peter Mansbridge (age 61, 33 years as anchor). Newman's departure is out of step with the anchor-for-life trend of Canadian TV news. Some background: Global's parent company - CanWest Global is in bankruptcy protection, so in a highly volatile industry, Newman's departure throws another complication into an already uncertain media industry. This departure may signal further changes: Could Robertson (who has denied he will soon retire) be replaced by Newman? At the CBC the return of Ian Hanomansing from the local CBC TV in Vancouver to a network reporter on the National has tongues wagging on Front Street about Mansbridge's future. More serious opportunities now present themselves. If TV management at all three networks think that this is only about serial anchoring, they will be missing an enormous opportunity to reinvent television news in a substantial way. In the early 1980s, the CBC moved its nightly news into a hugely successful one hour prime time package combining the best of daily journalism with sharp interviews and investigative documentaries. Could a similar sort of game-changer happen now? Is any network bold enough, (or wealthy enough) to try this again by harnessing the considerable reach of new and social media? In this Internet driven age, it's just a waste of resources to commit so much money and talent into a single nightly broadcast, as the US networks already appreciate. Morning TV now draws larger audiences pretty much everywhere. The nightly news serves a vanishing demographic. And the Internet continues to hold out its tantalizing but still elusive possibilities. It's a very tantalizing thought: an hour of information programming with reports actually from reporters at the scene. CNN keeps trying to re-establish itself as the "news" cable network, but it's ratings are in the basement. It would take a benevolent dictator to create and run such a broadcast on Canadian television. Is there such a person in Canadian television? Such a concept would take more than a gigantic leap of faith: cost, time of day for the show, technically on the cutting edge so that it shows on air, hiring first class people and letting them go to it. One thing, thought, there seems to be anchor available after August for just such a news broadcast!